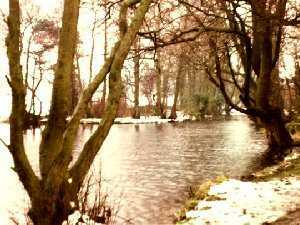 By their very nature, hidden haunts are not easy to find, but we will try to point you in the right direction. If you have trouble, contact the Tourist Information Office, and they should be able to help. They will have a Street Plan which you can purchase for a small sum. These are not taken in any order, and you may need to look at the Street Plan to find them. Town Fields is a narrow lane, found at the bottom end of Lower Sandford Street, and split in two by the A51 which cut through it when it was built in 1955-ish and left the two halves lost from each other. Be careful how you cross the A51. To find Leomansley Pool you will have to re-join the Walsall Road from Town Fields, and turn right in to Christchurch Lane. At the far end, turn right up the track, past the back of the flats, and then after about 300 yards turn left at Leomansley Cottage into the woods. This is a Public Right of Way, and takes you down past the pool which is on your left. Sadly the pool is somewhat overgrown and unkempt, but is still a good place to find birds and flaura in an area left as nauture would have it, because man has not looked after it for some years. Beyond the pool, the path forks to the right on to Pipe Green, and on the left from the Green you can see the burnt out shell of Leomansley Mill which may once have ground flour for the neighbourhood. The 29 acres of Pipe Green is owned by the residents of Beacon Street, strangely enough, although you have to live in the Street for a period of five years before you are entitled to join the owning Trust. It is supported by grazing during the Summer months, but may not be sold, and so is preserved in it's otherwise natural state in perpetuity. There is more about Pipe Green on the Round and About pages. 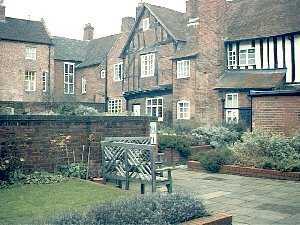 You may return to Lichfield by crossing the Green by the faint path which wanders generally in the direction of the Cathedral which can be see in the distance. 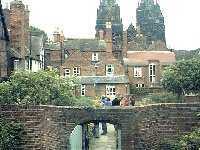 In the days when Lichfield was a walled city and farmers drove their cattle to market, they would not be able to get into the city past a certain time of the evening, so there was an enclosure, outside the city gates, called the Pinfold, which was a temporary holding pen, also used to enclose strays until they were found by the rightful owners, and looked after by the Pinner. 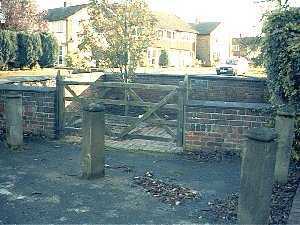 This example has been repaired by the Council and stands at the corner of Stafford Road and Pinfold Road. There is a plaque on the far wall which tells you all about it. Erasmus Darwin was the uncle or grandfather according to whom you read, of Charles Darwin, and the house in which he lived is open for visitors from Beacon Street. But if you go round the back into the close, you can get to it through the narrow passage about two doors on the left from the top of Cathedral Close access road. 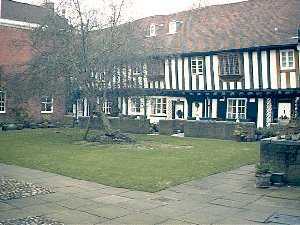 Erasmus Darwin House is the house on the left of the picture in the background. Here you will see an example of how Lichfield was about two hundred years ago, and is a fascinating study of time stood still. 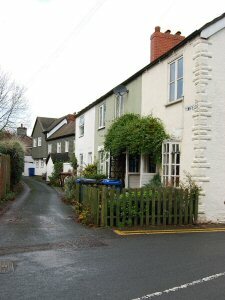 If you wander up through the garden and to the left of the timbered house in the centre of the above picture, there is another narrow alley which leads through to the Vicars Close which is another quiet backwater of the same era, shown on the right. The Crucifix Conduit was rebuilt in 2001 and replaces an old drinking fountain that stood near this place in times of old of this name. 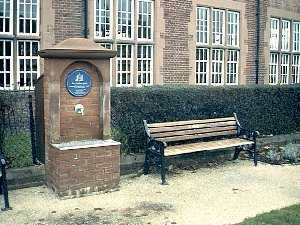 This memorial lies at the crossroads of Bore Street, Friary Avenue, St John Street, and Bird Street, and has the library in the background which was formerly the Friary Girls Grammar School. Lichfield had piped drinking water as far back as 1301 piped from Aldershawe and Pipe Hill to the South West of the city and was retained until 1923 when the South Staffordshire Water Works took over the provision of water to the City.